Even though beards have fallen in and out of fashion throughout history, today a beard gives the fashionable gentleman a distinctive look. Having a properly kept beard is a timeless statement of style. A bushy, ragged, poorly kept beard won't do you any favours. If you make the commitment to grow a beard, taking proper care of it is an absolute necessity. Trimming your beard, making sure that the hair is properly conditioned and styling it, are all necessary to make sure your beard looks good. This is where a high-quality natural beard wax comes in. Check out our great selection. Using a high-quality beard wax is important when styling your beard. It'll help keep it looking tidy and put-together. Depending on the length of your beard, it'll also help living with it a lot more comfortable. Another function of a beard wax is to keep your beard well conditioned. Similar to hair or moustache wax, beard wax has ingredients that help your beard look healthy and prevent dandruff or dryness. You've been taking care of your beard and watching it grow all this time. Would you put just anything on your face? Of course not. When choosing your beard wax, take a look at the ingredients. For starters, make sure that the wax is natural beeswax. Avoid paraffin or any other petroleum derivatives. Paraffin-based waxes became popular thanks to their low cost, but they bring about a couple of problems. First, they have a tendency to dry your facial hair, and second, they're not water soluble. This means that simply washing your face with soap is not enough to get it off. And nobody likes extra work. Next up, make sure your chosen wax has some high-quality conditioners. These are often oil extracts and nut butters. Sometimes, they're complemented by vitamin E to add extra shine to the beard. Another thing to keep in mind is the fragrance. This will literally be all over your face, so you need to make sure you enjoy the smell. If you have a hard time with fragrance, choose an unscented wax. The last thing to consider is the hold. If your beard is short, and you just want to keep random hair from popping out, then a low or medium hold beard wax will get the job done. 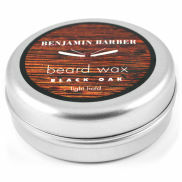 If you have a long beard, then consider a wax with more hold. Remember that you don't want to overapply beard wax, or you'll get that unsightly plastered look. Whatever your need, find one a good beard wax and keep your beard looking good.